I am currently halfway through my West Coast vacation and enjoying every second of my time here. It's been a bit of a whirlwind... Hartford to Seattle last Friday, with a layover in Minneapolis. Stayed with the siiiiister and BIL (brother in law), then Woodinville for a wedding of one of my college friends. Sunday I jetted down to San Francisco for a (way too) quick trip to catch up with friends and enjoy the unseasonably warm SF weather (kayaking on the bay!) Then it was back to Seattle to celebrate the 4th of July and mom's 60th birthday. I stayed with four different friends in four nights with 3 airplane rides. Phew! We will be spending our 4th of July with BIL's family in Gig Harbor. I'm looking forward to spending time on the boat, soaking up some rays, and relaxing with friends and family. Along with most American families, we will be BBQ'ing for the 4th. I will be making my Orzo Pasta Salad, the siiiiister will be making her "Cowboy Caviar" (I'm certain this will be making an appearance on the blog in the future), and I might whip up some white peach sangria just because. I hope everyone enjoys the holiday, and if you are looking for some ideas for your own Patriotic Parties, try some of my ideas below, or check out last year's 4th of July roundup. OK... so I know this appeared in LAST year's roundup, but c'mon. They're fruit kebabs. In the shape of an American Flag. If that doesn't SCREAM 'Merica, then I don't know what does. The aforementioned Orzo Pasta Salad. Mmmmmmm. So good with BBQ'd chicken or burgers. And no mayo to get all slimy and gross in the hot summer sun. Speaking of salads, this Heirloom Tomato Salad is so easy and so colorful. It's all the flavors of a caprese salad you love in an easier-to-eat-and-serve form. Ok...one more from the salad department. Iceberg Lettuce Wedges are a fan favorite... especially when paired with grilled steak. 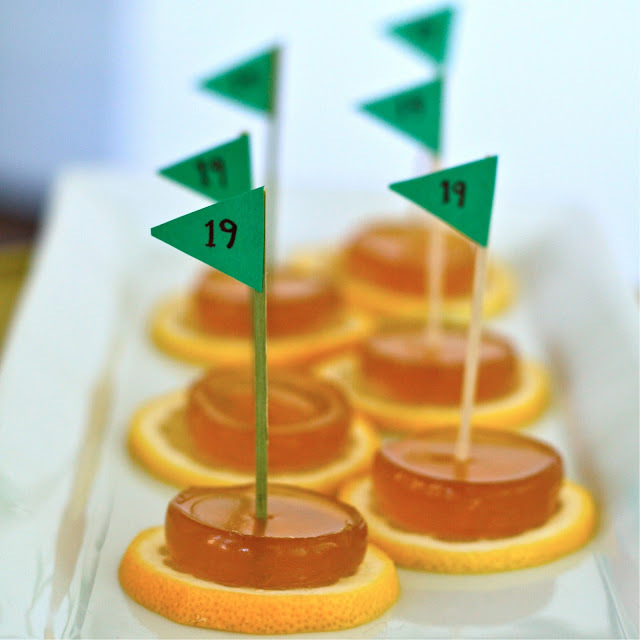 These mini versions are great for guests grabbing food on their way through the buffet line. A BBQ isn't complete (in my opinion) with out some sort of chip and dip combo. I *love* this Tomatillo and Avocado Salsa. It's like fireworks for your mouth. Making your own chips is a snap too! (Though I give you permission to buy some at the store). Onto the main event. I'm really digging grilled chicken right now (part of my new healthy eating kick). 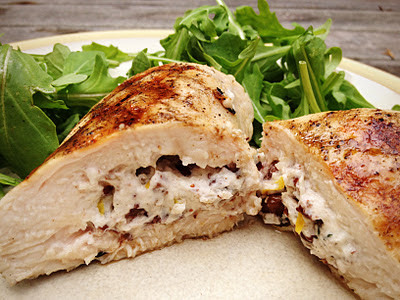 But plain chicken can be boring... so try stuffing them with some of your favorite ingredients. These ones have goat cheese and pecans. I also love a combo of goat cheese, sun dried tomatoes and basil. If you really want to get fancy, try grilling a whole fish in a banana leaf! Recipe courtesy of guest blogger Jullie Anne. An e is for eat roundup wouldn't be complete without some type of jello shot. These Arnold Palmer shots just radiate summer! And for dessert. We know Apple Pie is the quintessential American dessert. Try making it into an ice cream for the ultimate American cool treat. What's on everyone's 4th of July menus? Please leave a comment below to share and have a happy and safe 4th of July holiday!